The Buick LaCrosse was introduced in 2005. At the time its highlighted features included 6 passenger seating, a spacious trunk and a quiet and stable ride. It was produced from the same platform as other General Motors products such as the Pontiac Grand Prix but was marketed as much more luxurious. 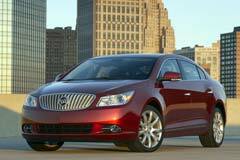 When considering the purchase of a used Buick LaCrosse you will have 3 trim levels to choose from. The CX, CXL and CXS were initially offered with the "Super" joining the lineup in 2008. The CX and CXL came with a 3.8 liter V6 that generated 200HP. The CXS came equipped with a 3.6L V6 upgraded to 240HP. The "Super" was just that, providing 300 horsepower compliments of a 5.3 liter V8. All were front wheel drive with a 4 speed auto transmission. The CXL included upgrades from the CX like leather upholstery and automatic climate control. While a used Buick Lacrosse is more likely to be targeted by the older generation as a premium luxury sedan, the more recent model years display a good amount of styling and athleticism that may appeal to the younger set as well.